Quercus phellos (willow oak) is a deciduous tree in the red oak group of oaks. It is native to eastern North America from southern New York (Long Island) south to northern Florida, and west to southernmost Illinois and eastern Texas. It is most commonly found growing on lowland floodplains, often along streams, but rarely also in uplands with poor drainage, up to 400 m altitude. It is a medium-sized tree growing to 20–30 m (65–98 ft) tall (exceptionally to 39 m/128 ft), with a trunk up to 1–1.5 m (3.3–4.9 ft) diameter (exceptionally 2 m/6.6 ft). It is distinguished from most other oaks by its leaves, which are shaped like willow leaves, 5–12 cm long and 1–2.5 cm broad with an entire margin; they are bright green above, paler beneath, usually hairless but sometimes downy beneath. 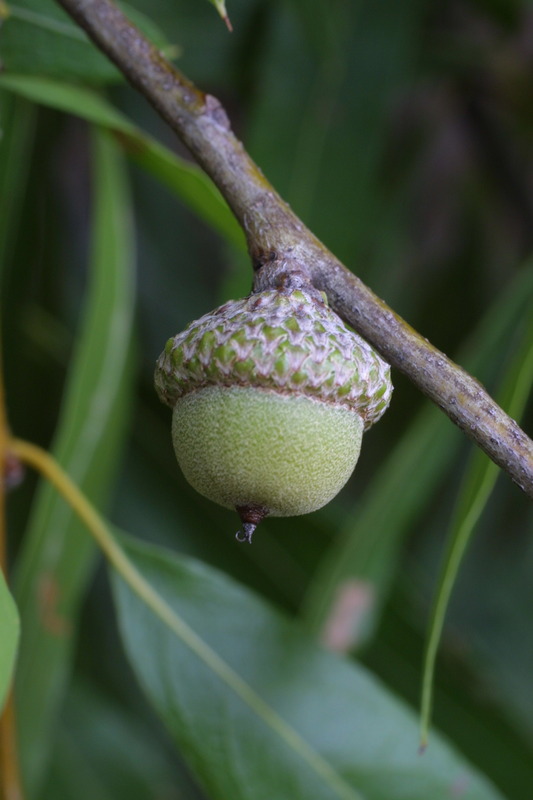 The fruit is an acorn, 8–12 mm long, and almost as wide as long, with a shallow cup; it is one of the most prolific producers of acorns, an important food tree for squirrels, birds, and other animals in the forest. The tree starts acorn production around 15 years of age, earlier than many oak species. Willow oaks can grow moderately fast (height growth up to 60 cm / 2 feet a year), and tend to be conic to oblong when young, rounding out and gaining girth at maturity (i.e. more than 50 years).